An academic paper by Richard W. Foster-Pegg, presented at the Pacific Coast Electric Association in March of 1980. During the mid-1970s and into the 1980s, Westinghouse Electric Corporation's Combustion Turbine Systems Division actively participated in numerous industry-sponsored studies of the conversion of existing steam turbine power plants to highly efficient combined cycle power generation with the addition of a gas turbine to supply its "exhaust waste heat" to Thermodynamic power cycle. The benefits of converting older steam power plants to combined cycle included it being an economical way to add substantially more power generating capacity to an existing power plant site, and it was an attractive way to replace old boiler equipment with a gas turbine/heat recovery boiler while extending the useful life of the existing steam turbine generator and other balance-of-plant equipment. This form of power plant upgrade and expansion became popular in the U.S. some time after this paper was written. The Combustion Turbine Systems Division headquarters were located in Concordville, Pennsylvania, until it was relocated to Power Generation World Headquarters in Orlando, Florida, in 1987. Original 19-page academic paper by Richard W. Foster-Pegg, 1980: Private Collection of Harry L. Jaeger. Digital reproduction of original 19-page academic paper by Richard W. Foster-Pegg, 1980. Originally created by Richard W. Foster-Pegg. Copyright to this resource is held by Richard W. Foster-Pegg is provided here by RICHES of Central Florida for educational purposes only. 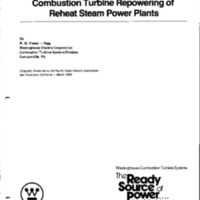 Foster-Pegg, Richard W.. “Combustion Turbine Repowering of Reheat Steam Power Plants.” RICHES of Central Florida accessed April 21, 2019, https://richesmi.cah.ucf.edu/omeka/items/show/7458.